People over Heroes (PoH) is a blog featuring an interview series about inspiring and creative people. PoH aims to highlight designers, engineers, artists, friends, family...basically all my heroes. Every single one of them is passionate, inspiring and deserves to be admired. Like all the superheroes that we know, they have secrets, ambitions, weaknesses and dreams. This project is all about discovering the hidden part of these people through unusual funny questions, because I trust that everybody has an inner hero part. I decided to create People over Heroes when I moved to San Francisco. As a designer, I admire a lot of great pixel makers/artists and it was awesome to finally meet some of them in real life. I've always considered them as part of my professional life since they were inspiration and motivation to me. So I figured that creating a place to gather my very own heroes could be a good idea. I chose the superhero/hero theme because, in a way, that's what they are to me. Plus, it gave me an unusual angle to prepare the questions I was going to send to my interviewees. Let's face it, there is a lot a great blogs out there, with killer interviews. Giving a 'geeky' theme allowed me to have fun and to give a more casual tone. I'm playing with 'heroes' and 'superheroes' references while reaching for meaningful details about my interviewees' personality. I really wanted to create a recognizable and fun identity to reflect the casualness of the interviews while highlighting the duality between being a hero and a simple human at the same time. 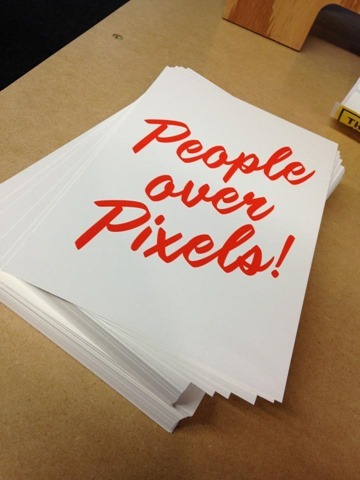 The name "People over Heroes" popped in my mind when I was staring at one of Facebook famous posters "People over Pixels". You need to think about the human being first. The idea behind the execution of the logo was to play with superpositions. The obvious word "Heroes" is written in a strong color with a bold type to identify the main topic, but I wanted to give the feeling that "People over" was written upon it, with a big fat Sharpie© to empowered the 'human' side of this project. I had some problems with the readability at first by adding a little bit of transparency helped. The colors are simple and easily distinguishable, and let's face it I love the mint green shade. Regarding the types, I'm trying to oppose the Brandon Grotesque with handwritten fonts, such as Besom or SignPainter. This is actually one of my favorite part of this project. One of the questions that I ask to my interviewees is: "Who was your favorite superhero growing up?" and it's really fun to discover their answers. I decided to create a unique illustration to represent every single one of them. The idea is to get this little thing capable of making the character recognizable, it could be Anakin's lightsaber to represent Darth Vader, or a phone booth for Superman. It's a good way to practice my illustration skills and to create a special artwork for my interviewees. I'm using the same style as the logo with an association of 2 colors and a superposition of layers to highlight the duality between being a hero and just a regular person beneath multiple layers of personality. I tried two different styles, but I finally decided to go with the second one because it was more readable and less confusing. I added a tiny gap between the color filling and the black strokes to reinforce the style and strengthen the identity. I have to say that sometimes I'm having a little bit of challenge while discovering superheroes I don't even know, but I *love* that! I found it more convenient to choose the written interviews process. The questions aren't easy/usual and I prefer when people take time to think about their feelings and their answers. Plus, I get to organize a photoshoot based on what I read about them, it's way more personal. I'm trying to be bold, contacting people that I admire, asking them to be part of my project and, so far, I'm pretty happy with the feedback that I get. I still have a lot of people to get in touch with though, but that's exciting. When I created the website, I really wanted to focus on the content of the interviews. I wasn't scared of white areas because it was all about highlighting the personality of my heroes. Their stories are amazing and I had to find a balance to share them properly. Too much text could make the interviews boring and hard to read till the end. Too many distractions, such as images, photos or videos, could break the immersion in the story itself. I'm basically using graphic materials to support the words and the story, not the other way around. More than simple ornaments, they give depth and visual structure to the interview. This project is really at its beginning. I've created a Facebook Page and a Newsletter to spread the word and give more visibility to the website. I'm having a lot of fun doing this and meeting my true creative heroes. I'm always looking for new people to interview so if you're interested just drop me a line. I'm thinking about expansions for the blog in the next couple of months, such as heroes battles and writings about experience/inspiration. At some point, I'm hoping to make a casual printed magazine, because I love working with print materials. I'm currently thinking about creating a set of goodies with my illustrations (stickers, patches, posters...). Basically, there's plenty of room for imagination and improvements, I can't wait to see what comes next.